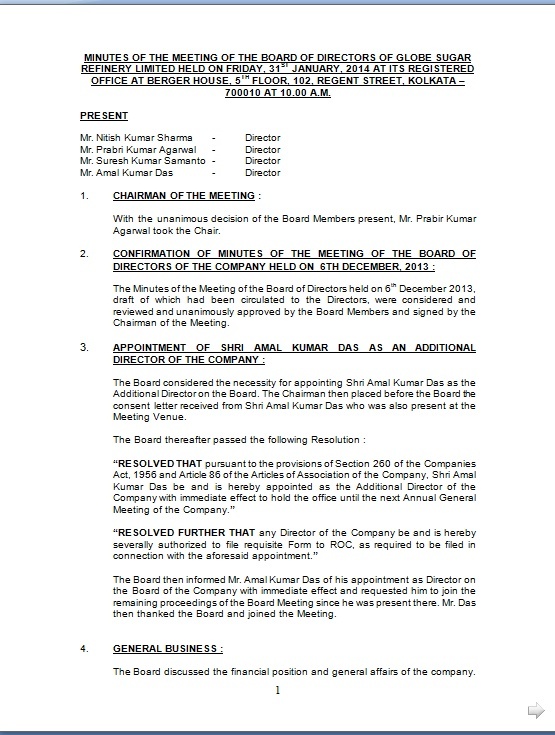 MINUTES OF THE MEETING OF THE BOARD OF DIRECTORS OF GLOBE SUGAR REFINERY LIMITED HELD ON FRIDAY, 31ST JANUARY, 2018 AT ITS REGISTERED OFFICE AT PARK PLAZA, 35TH FLOOR, 54, PARK STREET, KOLKATA – 700001 AT 10.00 A.M.
With the unanimous decision of the Board Members present, Mr. Prabir Kumar Agarwal took the Chair. The Minutes of the Meeting of the Board of Directors held on 6th December 2017, draft of which had been circulated to the Directors, were considered and reviewed and unanimously approved by the Board Members and signed by the Chairman of the Meeting. The Board considered the necessity for appointing Shri Amal Kumar Das as the Additional Director on the Board. The Chairman then placed before the Board the consent letter received from Shri Amal Kumar Das who was also present at the Meeting Venue. The Board then informed Mr. Amal Kumar Das of his appointment as Director on the Board of the Company with immediate effect and requested him to join the remaining proceedings of the Board Meeting since he was present there. Mr. Das then thanked the Board and joined the Meeting. The Board discussed the financial position and general affairs of the company.